In the public consciousness, there's a hard line between corp and runner. In the real world, things are a little more porous. The corp need the best hackers to run their networks, and some of the best hackers are ex-runners who like the idea of a regular paycheck. But sometimes things run the other way, and someone on the inside makes something like this. Ice Carver represents the Anarch way of life; slowly and steadily corrupt your obstacle. Gain access through decay. Let's compare it to its common counterpart: Datasucker. Does not require successful runs or limited virus counters to function. Affects all ice (save Lotus), all the time. Only succeptible to tag-trashing; safer for facechecking. Costs 2 more to install. Not capable of draining ice strength. Unique, limited to 1 at a time. Extras can be dead draws. High influence makes it harder to splash. Bishop - Best in Caissa decks, uses MU, cheaper, affects 1 ice at a time. Scrubbed - Costly current that affects 1 ice per turn, with unreliable results. The Supplier for cheaper install. Wyrm, as a neat April Fool's joke. I'm surprised its not included in more Anarch decks, considering its a super Datasucker! I know I'll try using it more often, especially in Anarch decks that set up first, run later. A resource that might be considered essential for the fixed breaker suite. It brings all strength 4 ice into consideration of the likes of Yog.0 and Mimic, and yet it did not see that much of an impact over the history of the game. This would likely be due to two particular points. First, its Unique status means you are only ever going to get one reduction of strength from it at a time, and future draws become dead cards. Second, as a resource it is still not tutorable, so to find it you have to draw and dig deep. It also means that more setup would be required before running on certain pieces of ICE, meaning the runner slows down. 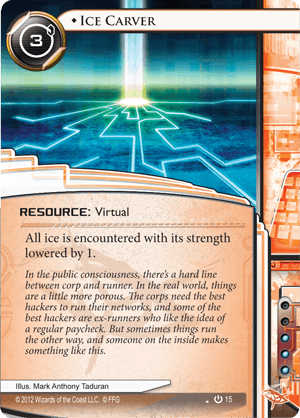 Aggression, or a way to stall (Control) the aggression of the other side, is one of the more important concepts any CCG or LCG, and in Netrunner it is no different. If you are going to be including Ice Carver then you need other ways to make the corp not move as fast as it might, while you look for it and get it set up to take advantage of its ability. Paige Piper might very well bring this card around again, allowing the extra copies to be tossed out of the deck early. This card creates some mixed feelings and really depends on the breakers you are running. For most rigs it means you save 1 cred per ICE (I ignore Stealth Breaker for this discussion), which means when you get it early enough it will save you the 3 creds you used to install it. But you also need a slot for it, so it should save you another 4 to become a sure gable. Will you break 8 ICE a game? Usually you will, so when you get it early it makes sense. On the other side as it is unique you don't want to have 3 offs in your deck and the other 2 become dead draws. So is it worth the deck slot when you see it late? On the other hand, when you have rigs that have awkward strength boost like Lustig or Passport it might save you more then one cred on a piece of ICE, main problem is, this are mainly criminal breakers and are currently rarely imported into anarch, while the question is, can criminals include it into their decks? On the other hand, currently we have the heap breaker (Paperclip, Black Orchestra & MKUltra) which beside of Paperclip have this 3 creds pump strength by 2 & break 2 subs. Especially against Fairchild 3.0 the first pump breaks nothing, similar ICE would be Ichi 1.0, Tollbooth, News Hound and Cortex Lock. So currently Ice Carver shines together with this breakers as for some ICE it will immediately save you 3 creds to break subs and you can see this is a great efficiency and within the anarch faction. So until these breakers rotate Ice Carver is a very strong econ card that can save you dozens of creds during a game. And it has to be seen as a pure econ card that can replace one Liberated Account in terms of value.